Students achieve unanimous approval of plastic soda and water bottle ban. 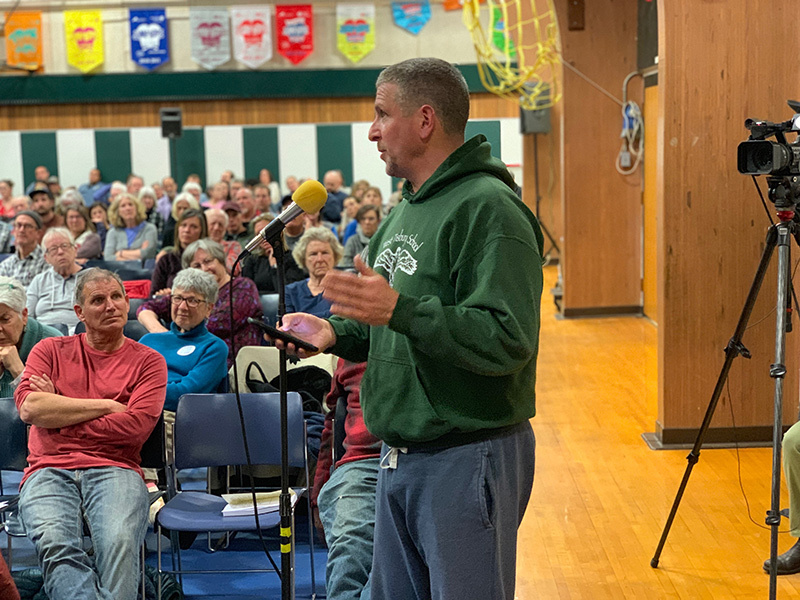 West Tisbury voters approved two major pieces of legislation Tuesday night in the first leg of annual town meeting. 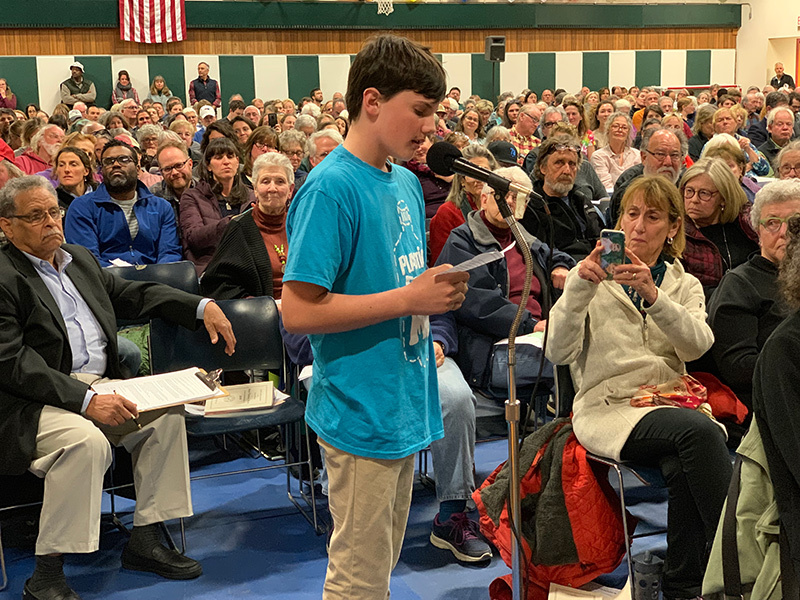 By a unanimous vote, the blue-shirted fifth and sixth graders of Plastic Free MV achieved a landmark bylaw that will prohibit the sale or distribution of plastic soda and water bottles of less than 34 ounces in the town of West Tisbury. The ban is potentially the first of its kind in North America. 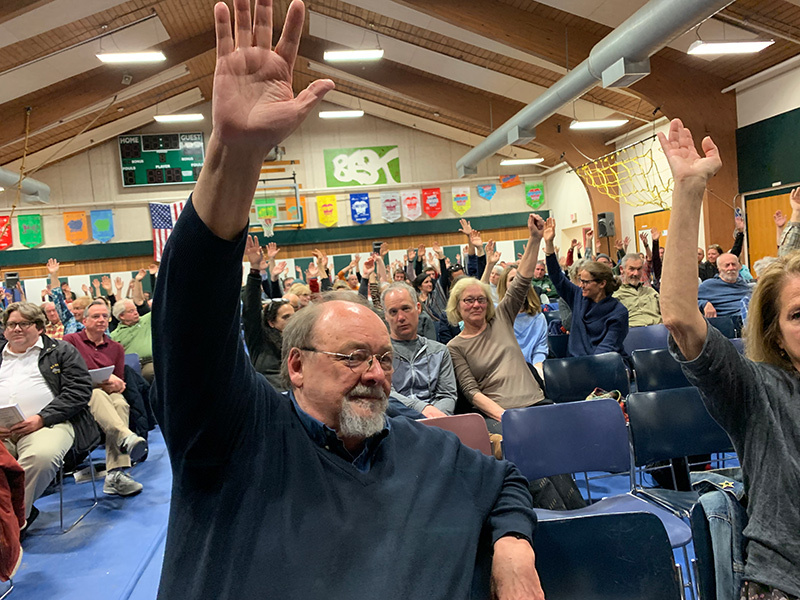 After hearty debate, West Tisbury approved the Martha’s Vineyard Housing Bank by a 184-58 vote. 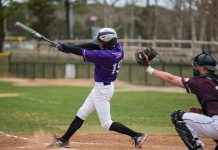 With the vote, West Tisbury became the first and only town on the Vineyard to adopt the concept thus far. 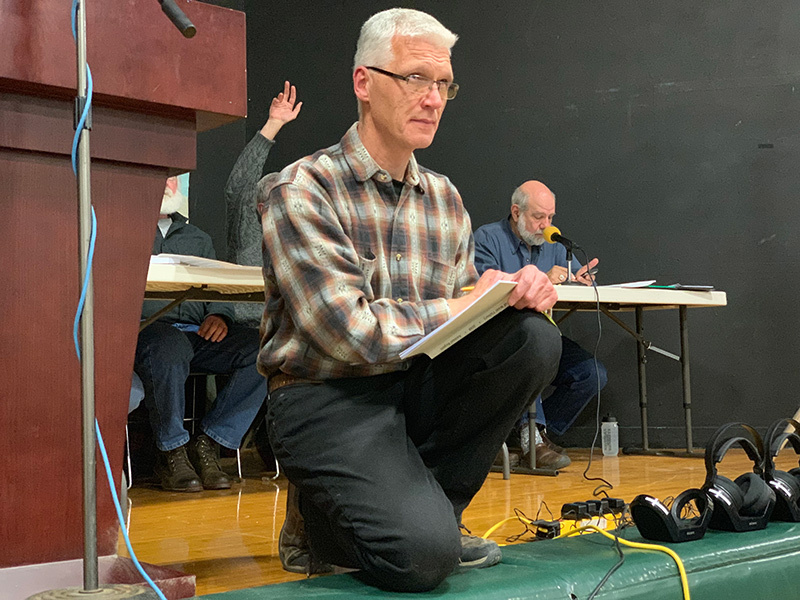 Voters said no to moving the annual town meeting from its traditional Tuesday calendar position to a Saturday by a 175-124 vote, and said yes to a $32,484 request from Dukes County Sheriff Robert Ogden for communications center maintenance and upgrades by a majority vote. 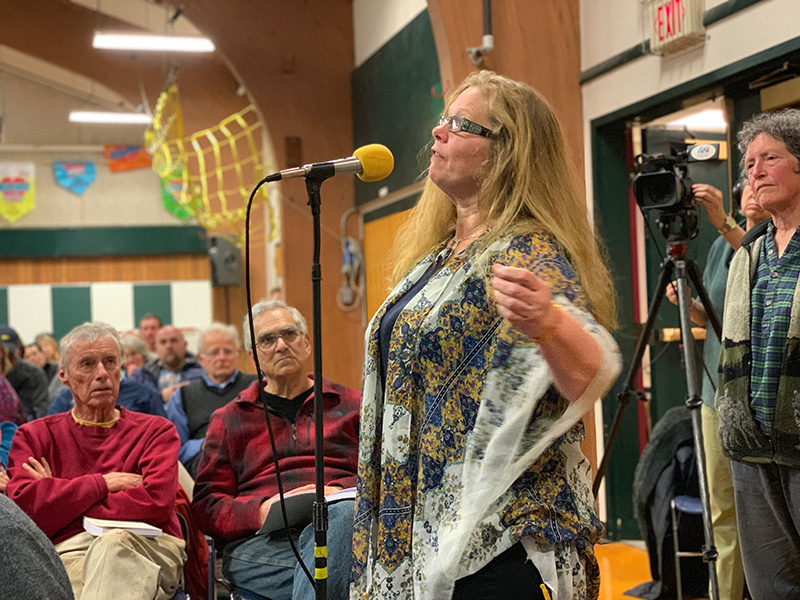 West Tisbury poet laureate Spenser Thurlow began the meeting with a poem before town moderator Dan Waters cracked open the warrant, and in short order the bottle ban bylaw was up. Chef Dan Sauer, who co-owns 7a Foods with his wife, Wenonah Madison Sauer, spoke in support of the bottle ban. 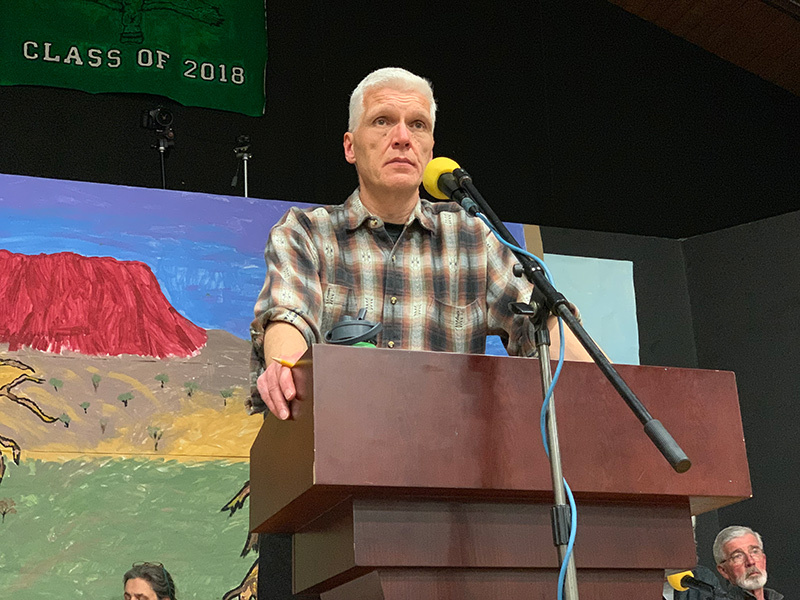 “I just wanted to say, after a lot of thought and discussions with my wife, and meeting with the kids, we’ve decided to fully back the bylaw,” he said to applause. 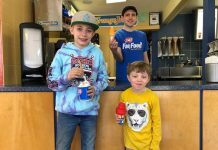 Sauer went on to say while the ban stands to be burdensome on his family’s business initially, “the handwriting is on the wall” with regard to plastic, especially because of sea changes in China that have resulted in a low point for plastic recycling. 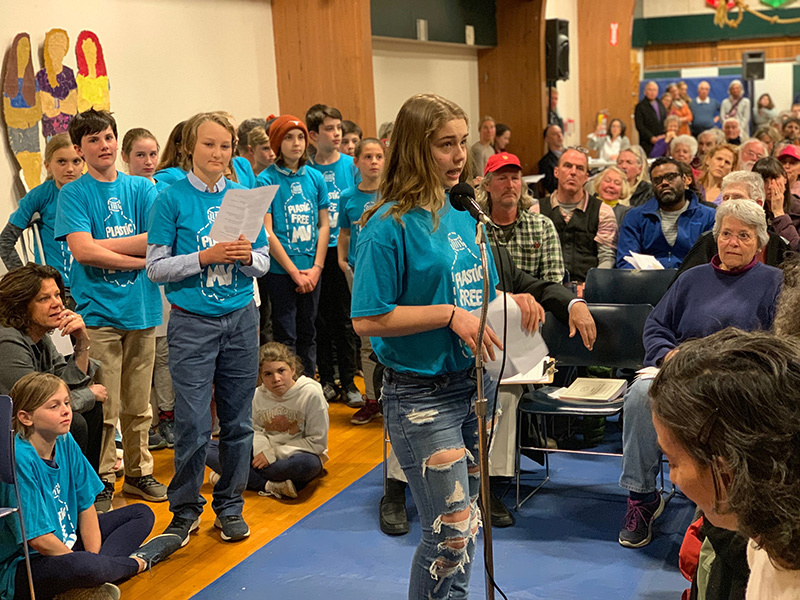 “We’ve been working all year on a bylaw to reduce the amount of single-use plastic in our community,” West Tisbury School student Josie Powers told voters. “It often feels like there’s nothing we can do to help our environment, but limiting the amount of single-use plastic bottles is something we can do. When we first learned about what single-use plastic does to humans, fish, and seabirds, as well as its environmental impact and its role in climate change, we knew we had to take action.” Fellow students Tasmin Strom, Broden Vincent, and Emma Bena went on to speak at length about the detriments of plastic in the environment and the community outreach they and their peers have engaged in. 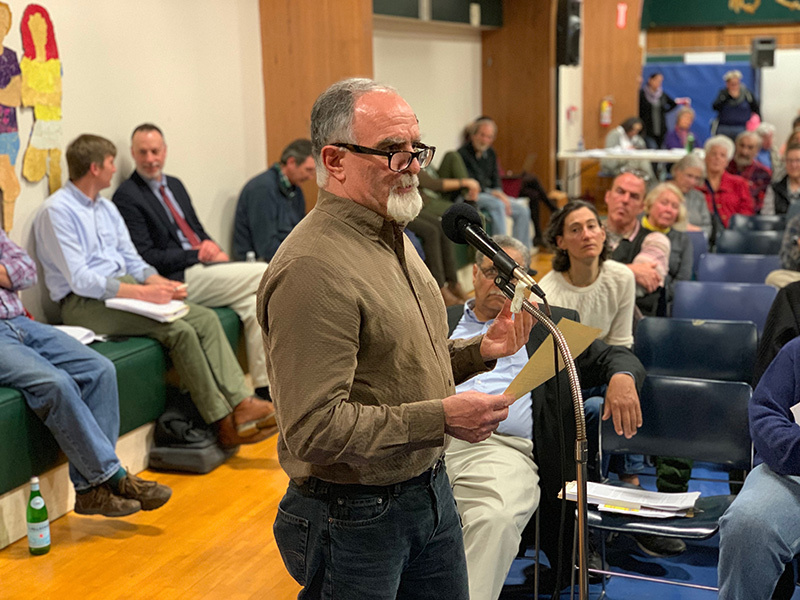 Aquinnah and Chilmark will take up the issue at their upcoming town meetings. Plastic Free MV hopes to place the bylaw on down-Island town warrants next year. 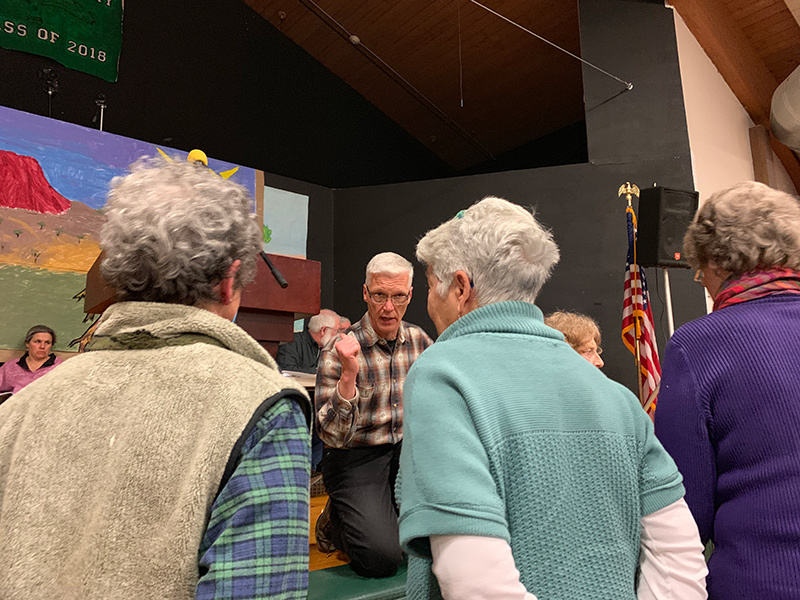 An amendment from the floor was approved to change the start date for the ban from Jan. 1, 2020 to May 1, 2020. The article went on to its unanimous approval without debate. 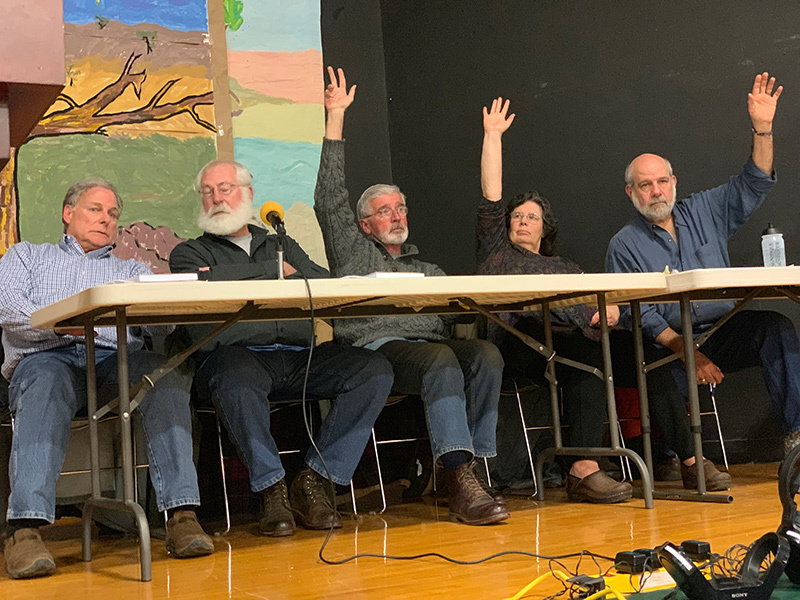 Much of the commentary during the meeting was centered on the Housing Bank, which at concurrent town meetings Edgartown and Oak Bluffs scuttled, and Tisbury didn’t take up before the clock ran out for the evening. 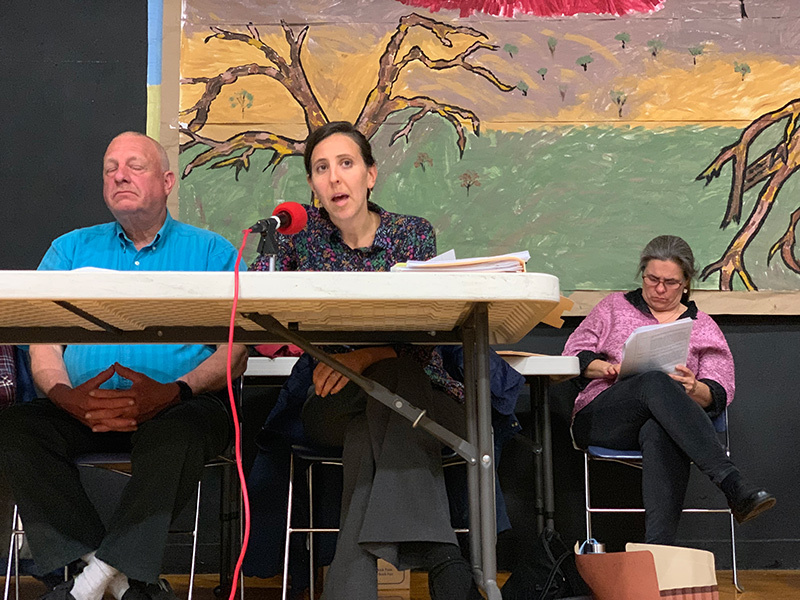 The article was taken out of order and wound up being the final article deliberated Tuesday night before Waters suspended the meeting activity. 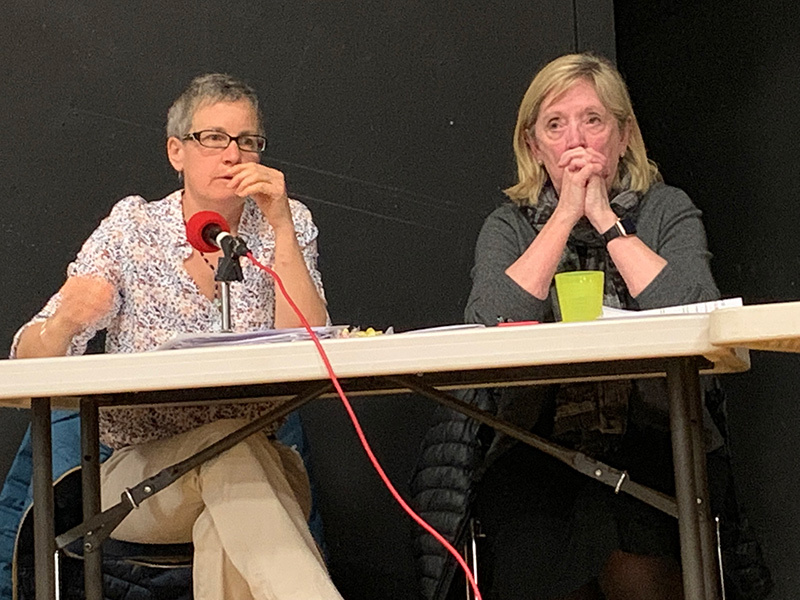 Jane Flanders spoke out against the Housing Bank, saying it would devour housing in the next 20 years in a similar fashion to the Land Bank’s consumption of land. She and several family members are people in need of Island housing, but she still wouldn’t support the article, she said. Town counsel Isabelle Lew said a number of concerns arose upon legal examination of the Housing Bank article. Among other flaws, she said there were instances of imprecision, absent language, and contradiction. 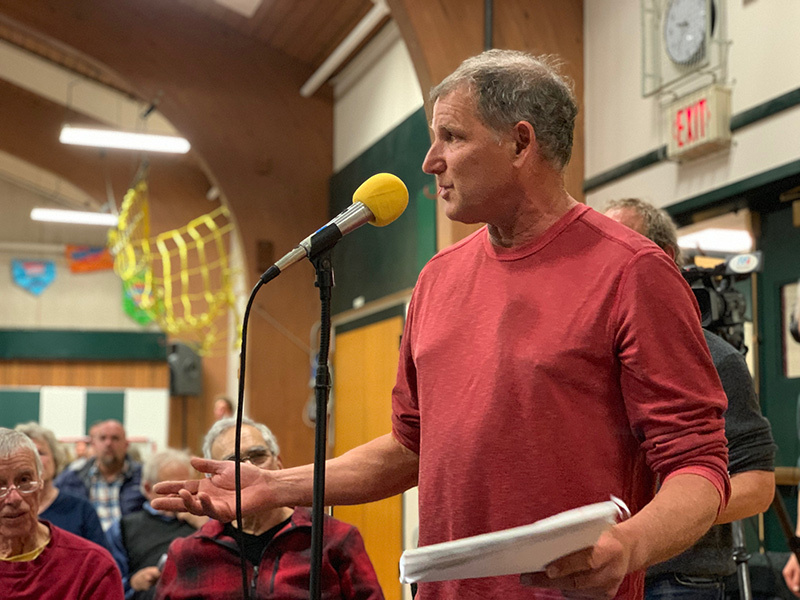 Ted Jochsberger, a participant in the Housing Bank campaign and a town affordable housing committee member, said voting down the article would have consequences. “You don’t vote for this, fine,” he said, “but years from now, when there are fewer younger people on this Island than there are older people, when you have an understaffed fire department, when you have an understaffed hospital because there is no long-term housing …” Jochsberger let the audience fill in the rest of his sentence for themselves. 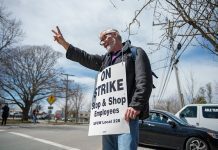 Outgoing finance committee member Doug Ruskin, a vocal proponent of the Housing Bank, spoke to town counsel’s criticism of the article. 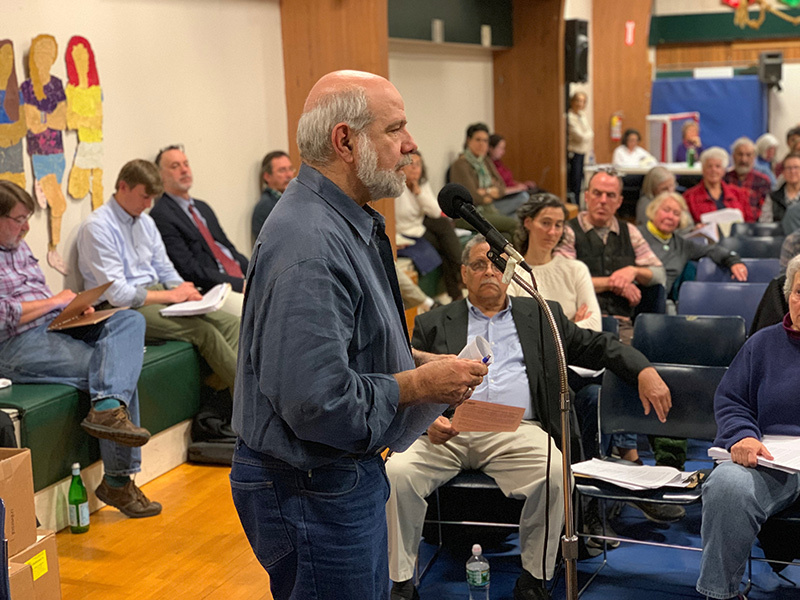 “We knew when we went forward with this that it could not possibly be perfect, anymore than the rotary was perfect when it was proposed,” Ruskin said. 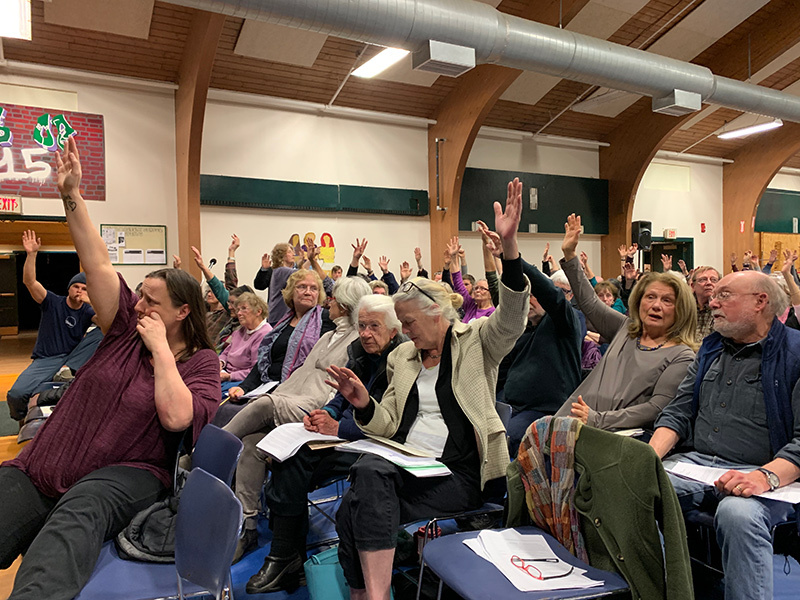 When the votes were counted, applause erupted at the town’s support for the Housing Bank. 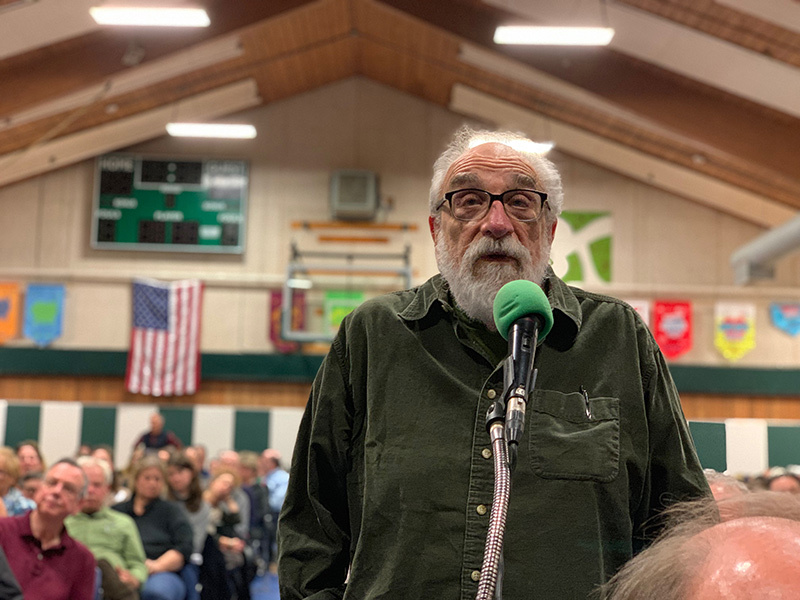 Unaddressed Tuesday night were marijuana zoning, pool zoning, special ways zoning, and a water withdrawal prohibition — all major articles that will be taken up Wednesday night as town meeting continues at 7 pm in the West Tisbury School. just to point it out– the plastic bottle ban was “unanimous” not a single voter out of 300 said no. That really says something.. Good job by our younger citizens… very well thought out. We don’t want poor young people leaving the Island, they might find a nice house and a good job. Let’s keep them here, in this unfair economy.